Panel from Chris Fairless' contribution to The Sorry Entertainer: "Human Statue"
Great project here from regular contributor Nick Soucek and fellow Bristol student Simon M. supporting unpublished comic artists from across the globe. The Sorry Entertainer Newspaper Anthology is a collection of original, specially commissioned work that needs your help to see it in print. These contributions aren’t your usual superhero fare – they’re specially commissioned works of underground, alternative and small-press storytellers, spinning yarns of sad theatre performers, blackmailed entertainers, plane crashes, wrestling matches gone wrong, flatulent stand-ups, persecuted human statutes and of four eyed-wonders – plus a whole lot more besides! Depending on how much you donate, you'll be rewarded with anything from a copy of the tabloid sized newspaper to mini comics by the contributors and even original artwork. So what are you waiting for? Throw your pennies into the hat to let this admirable collection of beautifully drawn comics out of your computer screen and into your eagerly-awaiting fingertips! 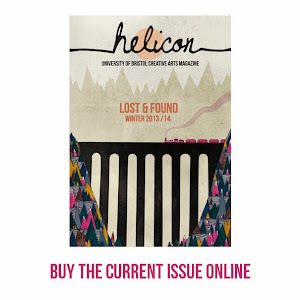 Helicon is looking for a new editor!